Found throughout Britain but with only scattered records from the west country, Wales and western Scotland. A species of damp and shaded habitats; woodland, mature grassland, waterside vegetation and gardens, usually where the soil is humus rich. Found occasionally during spring evenings in Cassiobury park on pathways and in pitfall traps close to water. Sometimes found among flood refuse or in deep moss samples in winter. Flightless, breeds in spring. 6.5-8.5mm. Very distinctive and soon recognised in the field; separated from superficially similar carabids e.g. 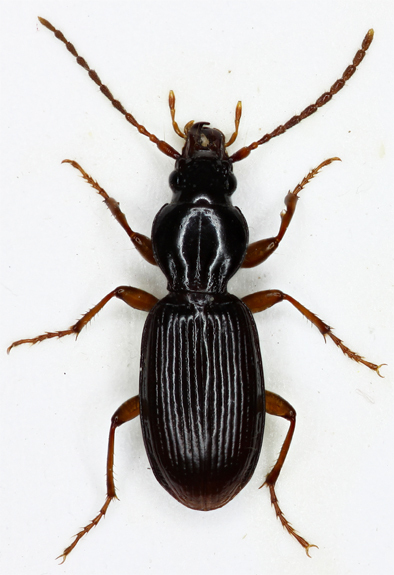 Pterostichini or Patrobus by the straight elongate mandibles and long basal antennal segment (compare this with segment 2.) Pronotum cordate. Elytra with deep and punctate striae but without dorsal puntures, scutellar striae absent. 2 supra-orbital setae. Dark brown, appendages lighter, upper surface piceous. Male with 3 dilated protarsal segments.